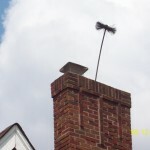 The National Fire Protection Association states, “Inspect your chimney at least once a year….” Our experience has shown us that under “normal burning conditions” it make take about one cord of wood burned in a fireplace to produce enough of creosote build-up to warrant cleaning. This is only a rule of thumb and under certain burning conditions the need for sweeping could be much sooner. When in doubt, call for a professional inspection! To assure the best service, we train our technicians to the NCSG standards and all NFPA-211 codes. We design our equipment for every type of chimney, whether a large fireplace, furnace flue or factory built system. We remove all brush-able creosote and soot without damage to the fireplace or chimney. This includes the elbows in factory built chimneys or connector pipes, which can become separated by using improperly sized or inappropriate brushes or rods. We do the work both from the outside and inside the home. This is done using proven methods to assure that no soot or creosote escapes into the room. Drop cloths, rug runners, a high speed vacuum, tarps over the fireplace and shoe covers allow us to guarantee mess-free cleaning! We remove all soot and creosote during the cleaning process of the smoke shelf and firebox.